Rep. Ocasio-Cortez, who previously worked as a bartender, is the youngest woman ever to serve in U.S. Congress and is known for her high profile social media presence. The Green New Deal is a recently unveiled plan “calling for a massive jobs program to stave off climate change, aiming for an enormous investment in “clean, renewable, and zero-emission energy sources” over the next 10 years,” the Washington Post reports. 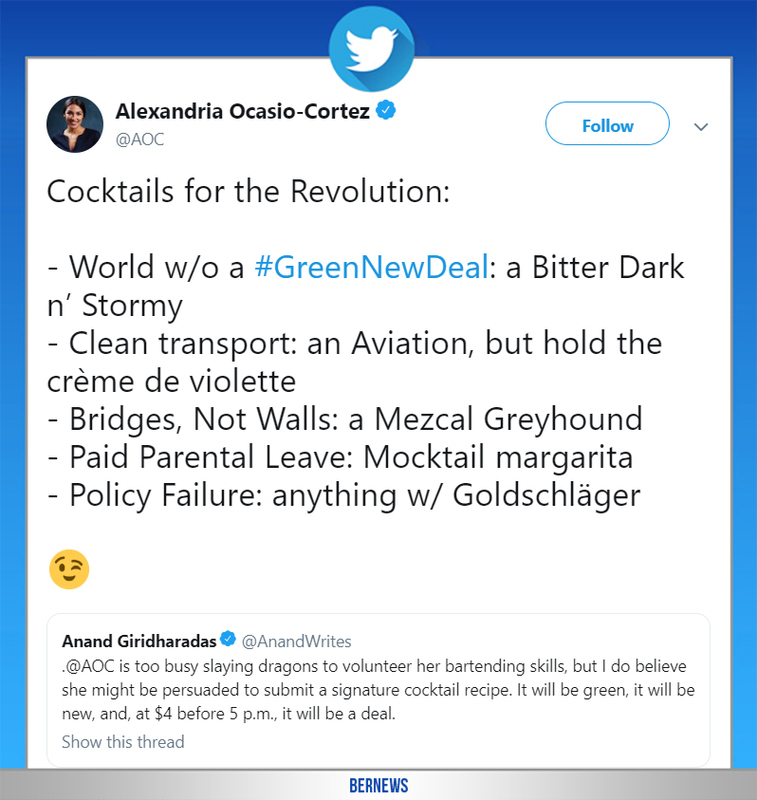 The roll out of the plan was not without controversy, with Business Insider noting that a line on Rep. Ocasio-Cortez’s website supporting “economic security to all those who are unable or unwilling to work” resulted in backlash, and prompted mixed messages from her team about where the line came from, and whether it was ever intended to be part of the landmark Green New Deal policy package. You must be a Trump supporter…shut up! You’ll be long gone before 2020 THANK GOD! She is everything that is right within politics…only old WASP’s getting petrified when they sense a threat to their core. Have you read what’s in the ‘Green Deal’? She’s nuts. By ‘anyone that thinks like him’, you mean people who hate foreigners, right? He is literally too dumb and blinded by his own hate to see that he and Trump’s mindset are exactly the same. Anti-immigration. Anti-gay. Anti-people who doesn’t look like him. I dont hate foreigners, I hate when foreigners come to Bermuda and abuse their social and economic advantage to undermind Bermudians. Dr.E.F.Gordon is a perfect example of a foreigner neglecting a greedy, selfish motive to enhance the well being of the Historically opressed. You said: “Trump and anyone that thinks like him are @$$#0£€$”. That’s you OJ. That’s what YOU are. Anti-foreigner, anti-immigration, anti-gay, anti-anyone who doesn’t look like you. the entire world is made up of people who more social and economic advantages than most Bermudians. go back under your hate filled rock. If you gave OJ a trip mine he’d walk into it himself. Sets himself up every time. Ummmm…how bout anyone that hates anything that isn’t a certain race … build that wall …. So does your fellow bloggers, are you gonna chastise them. Just like Fahey chastized Bermudians for nagative comments against foreigners, but never chastised foreigners for making negative comments about Bermudians. Black Bermudians have been catching $#!+ for too long, times have changed. I was actually speaking to “Concerned”, so… yeah… as usual, you are wrong. I WAS “chastising then”… but I obviously touched a nerve…. Don’t you ever get tired of being absolutely and so easily proven wrong about pretty much everything you write? Doesn’t all this hate you spew, all based on false premises and lies… doesn’t it start to make you feel sick about yourself? There is a law against false accusations, lemon tart. Press charges… I dare you! Hey onion tart, if there really was a law, don’t you think you’d be locked up, again? Any actual arguments, or just name- calling? She is the Democrat version of Trump. Clueless and more interested in social media then actual governing. But hey if she gets her “Green Bill” through (which it never will) at least we will be done with planes and farting cows and all those ‘unwilling to work’ will still be paid for just being alive. Lol. Her plan requires the super rich to pay tax at 70% or more. The super rich that live in the United States don’t live in Communist China. They can giddy up and leave the United States. I wouldn’t blame them frankly. Why should they fund new technologies and products to fund all of her “free stuff” policies? So if she doesn’t get all that tax revenue, guess who is going to pay for her grand plans. Everyone BUT the super rich. It is a plan destined to failure on that basis alone. I won’t even bother to address the problems with her self imposed “pie in the sky” deadlines to end the use of fossil fuels etc. or get into all of the massive government projects that have fallen victim to corruption from top to bottom in the “green” industries to date. Nope. It will never get off the ground because there won’t realistically be the money available to pay for it. Speaking of Communist China, they are the WORST environmental abusers on the planet. Logically if you don’t get China to buy into her little plan the planet will continue to be polluted by those who pollute it the most. That is why she is a nutcase…in a nutshell. I hope the super rich ALL MOVE HERE! C’mon PLP… this is your chance to welcome people here who will spend millions on local services. Give them status for $x and let’s get on with it! Careful, now. Too much (or any )logic and fact will explode the heads of most of the commenters here. Typical, telling us to shut up. Do independent research instead of running your ignorant mouth. So true, she is a couple of fries short of a Happy Meal.